Welcome, Dr. Caroline A. Mohlstrom. 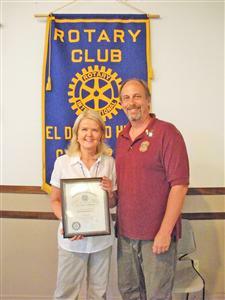 Dr. Caroline Mohlstrom officially became an El Dorado Hills Rotarian Wednesday morning. The chiropractor, who lives in Placerville and owns/operates Oak Hills Chiropractic Center in El Dorado Hills, has attended several club meetings since December 2010. Mohlstrom said she looks forward to getting involved in the community.